A Super Drop Diamond in The Ballad of Gay Tony. 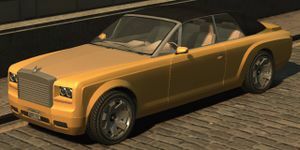 The Enus Super Drop Diamond an ultra-high luxury convertible in the The Ballad of Gay Tony episodic game for Grand Theft Auto IV. The Super Drop Diamond is simply a two-door variant of Super Diamond, being largely the same in length and size; this necessitates the car retaining its four-seat configuration (the front seats are roomier than those of the Super Diamond), although the car can only hold two in-game. As such, the Super Drop Diamond resembles the the Rolls-Royce Phantom Drophead Coupé, specifically the Bijan edition. The car is permanently golden with a beige hood lid, and features an optional black vinyl roof, usually when raining or at night. Doors can be opened by conventional way, contrary to the Rolls-Royce Phantom Drophead Coupe's suicide-style doors (which are hinged to the rear). Like the Super Diamond, the interior of the car is derived from a Schafter, but additionally features a wooden rear dashboard. Much like the Super Diamond, the convertible features a rear wheel drive configuration, but comes equipped with an even more powerful engine (which may reference the prototype V-16 engine the Phantom originally would've had in real life), and a lighter weight to match up with the car's more sporty appearance. However, this makes the car unrealistically fast and agile for a vehicle of its size, feeling slightly arcade-like compared to the other vehicles in GTA IV. Its top speed is 360 km/h (224 mph), identical to the Super Diamond, and higher than any other car in the game. The vehicle was first seen in the "Meet Yusuf Amir" and the Weazel News trailers for The Ballad of Gay Tony. Unusually, the car never gets dirty, and as a result, the car cannot enter any car wash. The player can shoot from the car with the window glass still in place. The car shares the same rim design as the Cavalcade. The default radio station of this car is The Beat 102.7. The Super Drop Diamond features an alarm system, proven by spawning one with locked doors, just like the Super Diamond does. The Super Drop Diamond is only unique to Yusuf Amir, who uses the car as his primary mode of transport and is indicated to own four of them. At a certain point in the storyline in TBOGT, Yusuf will call Luis to inform that one of his Super Drop Diamonds is awarded to the player. From then on it will spawn in front of Yusuf's penthouse on Columbus Avenue. The only other means of obtaining the car is by spawning it using modifications. Oddly, on very rare occasions, will the car spawn a block south of the Algonquin safehouse, and unlike the usual times the car spawns at Yusuf's penthouse, the car is equipped with an alarm, regardless with the top up or down. The variant obtained from Yusuf Amir's penthouse takes visibly less damage than those spawned using hacks or mods. This page was last modified on 6 October 2014, at 10:10.